Former heavyweight champions David Haye destroyed challenger Arnold Gjergjaj knocking him out inside two rounds to put his name back in the mix for bigger fights. Haye dropped Gjergja four times before referee stopped the fight inside 2nd round. David Haye absolutely demolished Arnold Gjergjaj in what was a devastating performance by former heavyweight world champion. It took just two rounds for David Haye to finish the fight off infect Gjergjaj was struggling from the start as Haye dropped him four times in first round and finally put the curtains on Gjergjaj night with a onslaught where referee had to stop the fight. David Haye made a claim afterwards hoping to fight either Anthony Joshua or winner of Klitschko fury fight in next 12 months. His next fight is likely to be against Shannon Briggs later in the year. On the same card Shannon Briggs will be fighting Jakov Gospic and if both Briggs and Haye win their bouts a potential fight between the two will be setup for late 2016. David Haye vs Arnold Gjergjaj TV Coverage: There are number of fights on the undercard and the coverage will begin as early as 5:30 pm uk time. 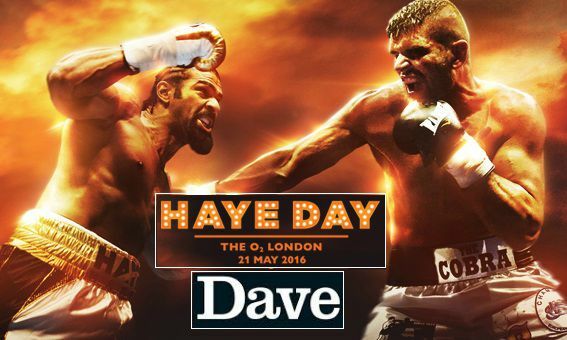 Just like Haye’s previous fight, this fight card will be shown live on UK’s free-to-air witty channel called “DAVE” who will have the live coverage at around 07:00 p.m uk time with several undercard fights leading upto 10:00 pm main-event between Haye vs Gjergjaj. Around 16,000 fans are expected to fill O2 Arena on Saturday while David Haye vs Arnold Gjergjaj won’t begin before 10:00 p.m uk time. It is a massive fight for David Haye who made his comeback to the rink back in January 2016 with a cruising win against De Mori. Haye has been persuing big fights against the likes of Anthony Joshua, Tyson Fury and for him to get big names he has to put up superb performances against the boxers like Arnold Gjergjaj and later on against Shannon Briggs.